If you had a chance to read this post a couple weeks ago, you got a little glimpse of what it’s like as a full-time CSA employee, a.k.a. this year’s summer job. I described a bit of the fieldwork and day-to-day tasks in my last CSA post. 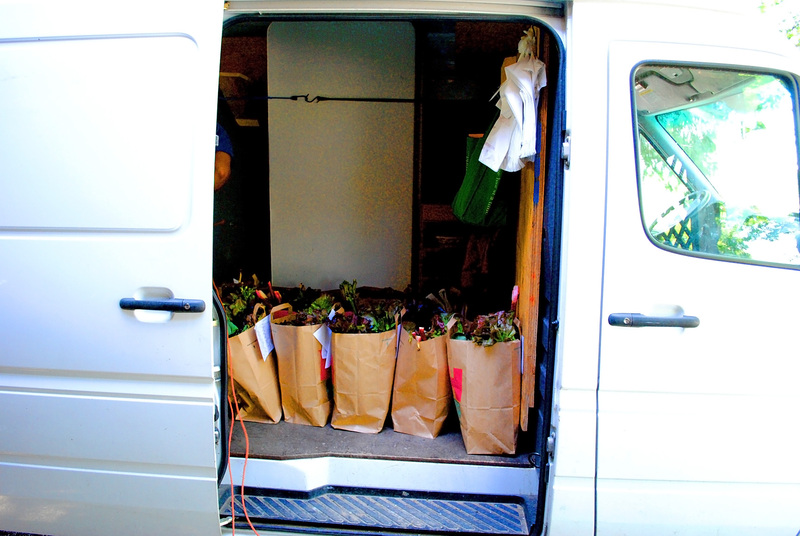 In this post, I want to give you a glimpse of what’s entailed in putting an actual CSA delivery together, and how I am involved with this at my work. 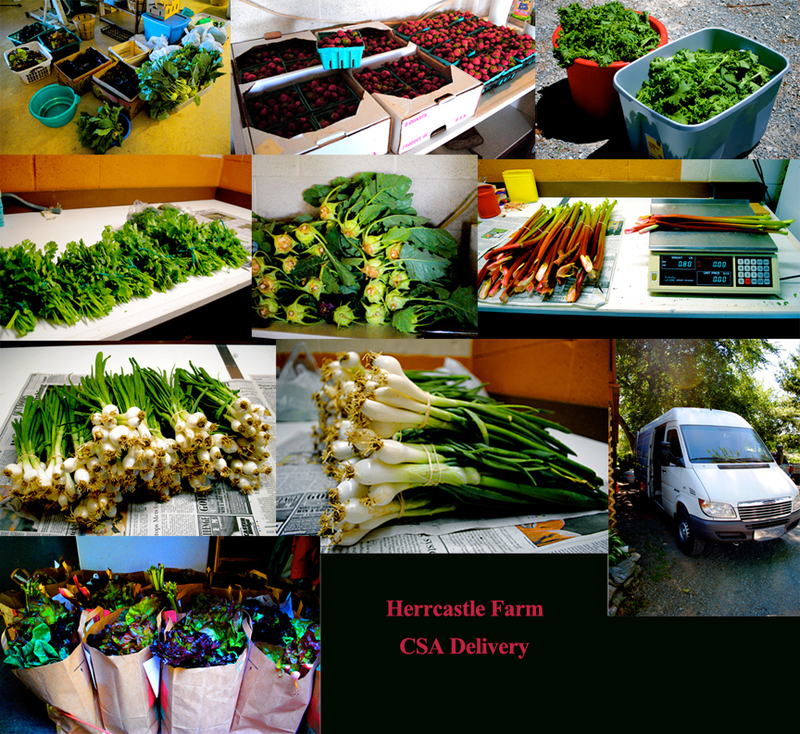 With over 30 shareholders (and presumably more still to come for the season) signed up with Herrcastle Farm’s CSA, my place of work, CSA delivery days require a lot of picking, pristining, preparing, and packaging. Each week, patrons receive 8 vegetable selections, one fruit selection, and one herb selection from the CSA’s extensive crop list. 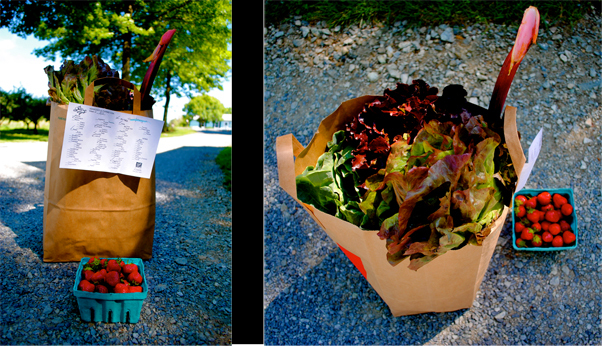 The CSA has two different CSA delivery days, falling on Tuesdays and Saturdays. They also are involved with two farmer’s markets on Wednesdays and Saturdays, and occasionally an additional one on Sundays. What this means for me? All day produce preparations taking place on Tuesdays and Fridays/Saturday mornings. Working on the farm has really opened my eyes to how much work actually goes into putting together produce for CSAs and farmer’s markets. I now really appreciate all those displays of clean veggies at farmer’s markets and realize that vegetables can’t just wash and bunch themselves. It takes a lot of hand work and time from the farmers to put together the farmer’s markets I so greatly love to visit. Clean sells. Dirty doesn’t. So while there may still be a bit of earthy dirt lingering on your veggies as you take them home from the farmer’s market or pick them up from a CSA delivery, trust me, those veggies had a ton more dirt on them before they got to their final destination. A good example in which I had never payed particular attention prior to my job at the CSA is the spring onion. Let me take you through the process of preparing spring onions. The first step: Picking. At my CSA, this usually entails the uprooting of about 200-300 onions, depending on the market. Third step: The haircut. After peeling, all of the onions have to get their whiskers trimmed. Those thin, brown strings coming out of the white bulbs of the onions are typically 3-4 inches or so long, and using scissors we trim them to about 1/4 inch. Fourth step: Bunching. Next, the onions need to be separated and bunched, typically in a quantity of 8-10 onions per bunch. Fifth step: Haircut #2. After being rubber-banded, each bunch gets the lengthy green hair growing out of the top of their heads trimmed down to about 12 inches or so. The five step process can take as long as a couple of hours until the spring onion bunches are ready to be beautifully put on display. Sometimes I feel like I’m working on an assembly line at a factory, cruising through several hundred foot rows of veggies, and cleaning and preparing what seems like endless piles of produce. After the onions, I might pick ten pounds or so of kale, collards, or swiss chard. Then I might move on to the mescalin mix, cutting it, weighing it, and then bagging it into 1/2 pound or 1 pound quantities. Next I might do the herbs, picking 300 sprigs of mint, and then bunching them into cute, fragrant bouquets. Then maybe I’ll go on to pick from the 100 foot row of snow peas, and then dividing them into individual pints. After doing a few more veggie preparations, such as bunching the kohlrabi or weighing and bunching the rhubarb, it’ll be time to start getting the CSA bags ready for delivery. As afternoon nears evening, one of the owners and I will start placing all of the earlier prepared produce into the lined up paper bags, quickly working to get the bags finished in time. Thinking about all of the customers waiting to obtain their CSA drop-offs is exciting. I think that receiving a bag tightly packed full or fresh, in-season produce is an absolutely wonderful way to get your groceries. When the bags are brimming over the top with the 10 different produce selections, it’s time to load them into the truck and send them off. On Tuesdays, I’ll typically work another hour or so, continuing to do a few extra preparations for the farmer’s market the following day, and on Fridays I’m usually free to go, alas heading home, that is, after a good 5 minutes of scrubbing my hands of industrious dirt. I don’t think I could have asked for much more of an enriching experience for a summer job at my age. Sure, I could be working part time in retail or as a cashier or something like that and probably still learning a great deal, but within just a few weeks, this job has already taught me such an unmeasurable amount about an area that is needed to live. The hard work spent out their in the field makes the small stuff seem easy, and I can really appreciate that. Even if just for a day or two, I think working at a farm is an experience that would be so valuable to everyone, really giving you a hands-on appreciation of where your food comes from and how it gets to your plate. Doing quantity with quality is such an eye-opening, learning experience, and has showed me that within farmer’s markets and CSAs, there is much more than meets the eye. I can’t say sometimes I wouldn’t rather just be laying out on my porch relaxing on my summer days, but at least I’m not cooped up inside doing work in no direction of my interests and missing out on everlasting memories. I agree, it’s probably a lot better to be out there, working towards something, that working at a mall. I didn’t realize all of the work that went into prepping the veggies for market/CSA delivery. Sounds like a tiring job! Wow I got tired just from reading all of that…this sounds like a great experience…thanks for sharing it with us! How fun! What an interesting and educational summer job! wow it’s great to hear things from your perspective! Thanks for sharing! Wow! What great insight. I really enjoyed reading through this post. THank you for sharing. 🙂 And yes, the experience working there will be very beneficial.